In 2009 T-ISS started an innovation project with the objective to improve the quality and environmental footprint of photo luminescent signs and Low Location Light strips. Today most sign makers use PVC, despite the fact that PVC is the single most environmentally damaging of all plastics. PVC contains halogens and their toxicity of smoke is of highest concern within enclosed spaces, which you will find on-board any ship or platform. During our innovation project we managed to replace PVC with a safe material, a modified recyclable polymer called PETX, which is free of halogens. Besides this new material the innovation went on, and we managed to innovate our printing process in such a way that the expected life is up to 5 times longer than the market average. The last upside is the visual appearance, SafeSign signs and Low Location Light strips have a high quality glossy finish, which is easy to clean. The use of these new materials and techniques helped us to achieve innovative product which is also more economical and looks better. 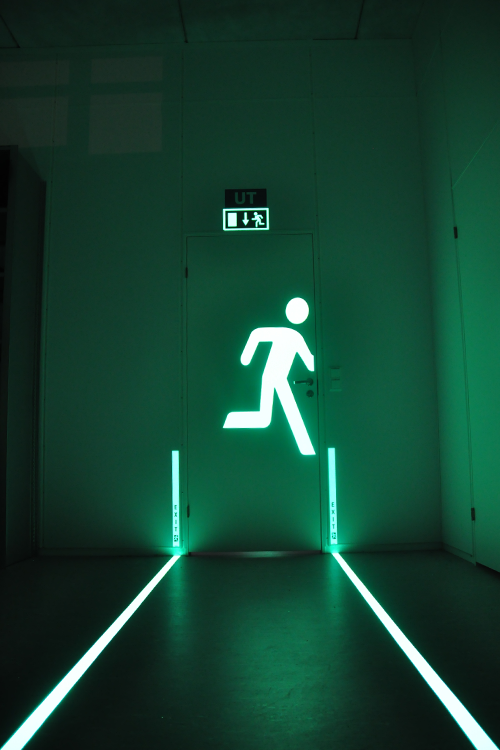 Alternatively to the commonly used profile/insert Low Location Light strips, SafeSign has developed Light Line strips. These Wheelmark approved, self-adhesive strips are an excellent alternative to the profile systems. We manufacture Light Line strips according to the same high standard as Safe Sign signs; back printed on PETX, which gives a glossy, easy to wipe clean, finish. No PVC, no halogens and 10 years warrantee against discoloration and on the photo luminescent properties. This is the solution to refurbish existing systems which do not meet the requirements. You can easily fix the Light Line strips on top of the existing system by the crew or yard, due to its self-adhesive backing. Upon request we can also manufacture Light Line strips to your requirements. Examples are non-standard colours, sizes and/or afterglow properties. These specials are always in compliance and always in the same high, environmentally friendly quality. T-ISS is a specialist for Low Location Light systems on Cruise Liners & Ferries. IMO & Solas regulations require that ships carrying more than 36 passengers shall be fitted with Low Location Light. The LightLine LLL system is the easiest and most cost effective system to install. Requiring only the application of the tape to the bulkhead and the positioning of exit direction signs at the appropriate places. 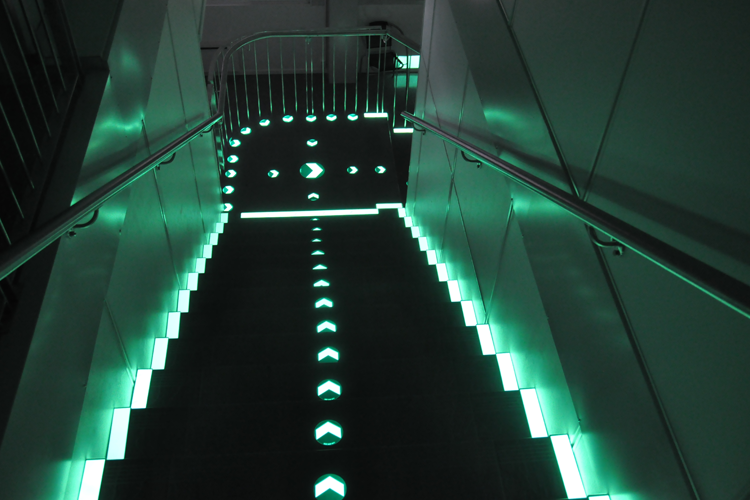 Our LightLine strips have a green lining at top and bottom of the strip. This gives it a high class appearance. All LightLine strips are DNV-GL certified. LightLine LLL profile system: is a system which comprises of an extruded aluminium carrier and rigid photo luminescent strips. Our standard is an angle profile with a 50mm wide visible strip. The performance of the rigid panels is certified by DNV-GL and easy to install. We can also create other shaped Low Location Light systems according to the demands of ship-owners, yards and architects. We reverse-print Standard LightLine strips in order to prevent damages to the photo luminescent layer. The strips are easy to clean and have a high quality appearance. We participate with many shipowners, yards and architects to find the optimal solution in design and quality of the Low Location Light system for their new-builds and refurbishments. For all your enquiries regarding Low Location Light systems, please contact us.